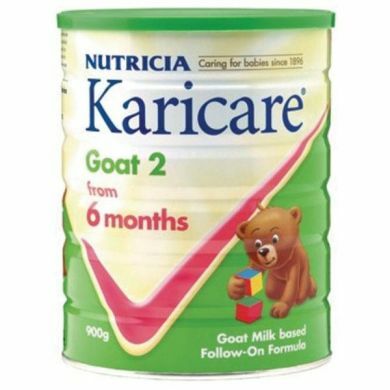 Nutricia Karicare Goat Follow-On Formula #2, for infants over 6 months. Karicare Goat Follow-On Formula is a goat milk based formula for bottle fed infants from 6 months and older, modified to provide the same quality nutrition as found in cow’s milk based formula such as Karicare Follow-On Formula. Recent recommendations discourage the use of ordinary goat or cow’s milk for babies under 12 months of age. Karicare Goat Follow-On is specifically formulated to provide more Iron and essential Vitamins compared to ordinary goat or cow’s milk. Karicare Goat Follow-On can be given by bottle, cup or mixed with baby foods.